Who made the 16 million pixel sensor inside the OM-D E-M5? Olympus is refusing to name who manufactured the sensor for its new Olympus OM-D E-M5 Micro Four Thirds camera, with speculation suggesting it has been remanufactured from the Panasonic G3. The Olympus OM-D's sensor is a 16 million pixel Four Thirds Live MOS sensor, which is the same resolution as both the G3 and the more recently announced Panasonic GX1. Speaking to us at the European press launch of the OM-D, Toshiyuki Terada from Olympus Japan, said, "We can't say who manufactures the sensor itself, but we can say it's a new device, not just for Olympus, but for the industry." Other rumoured manufacturers of the sensor include Fujifilm, which seems fairly unlikely given that it has only just announced its own Fujifilm X Pro1 compact system camera and it uses a novel sensor design which it doesn't manufacture itself, and Sony, which is known to create sensors for other camera companies including Nikon. It would make sense for Panasonic to have manufactured the Olympus sensor, as both the companies work to the same Micro Four Thirds standard and have a joint development agreement. Olympus claims that the sensor inside the OM-D offers improved noise and dynamic range performance, when compared to older models in its line-up, such as the PEN E-P3. Speaking of the decision to increase the resolution to 16 million pixels, Terada said, "In the past we have said that 12 million pixels is enough, and we haven't changed that position - but if we could put more in, then why not?" 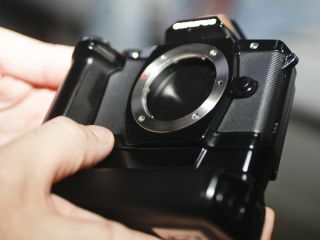 The E-M5 is thought to be the first camera in the OM-D line-up and will be available from April with an RRP of £1,149.